​What is your background in architecture, design or urban art projects? What made you join Mont Réel? What do you expect to discover or learn from being part of a collaborative workshop? 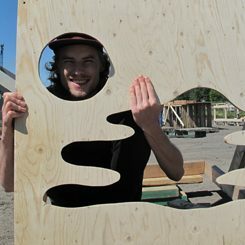 Vincent St-Louis est concepteur de bâtiments écologiques pour Habitat Libre Conception, il oeuvre aussi dans le travail de la charpente de bois massive. Il a terminé ses études techniques de génie civil en 2015, il souhaite co-créer des bâtiments vivants qui font partie intégrante de la forêt. Un projet comme celui-ci rassemble des experts provenant de plusieurs milieux et pays, une occasion idéale pour échanger et faire évoluer nos idées! J'espère prendre part au même processus naturel de création collective qui rassemble nos ancêtres depuis toujours,apprendre de toutes les interactions générés par ce rassemblement. I’m a current student with a major in architecture. The Mont Réel workshop fascinates me with its cool content, and it’s a chance for me to translate my artistic skills and architectural knowledge into a real-life design and construction practice in this city. I look forward to tackling the upcoming challenges together with my colleagues, and venturing through this exciting voyage of making a big real-life architectural project from zero to one. 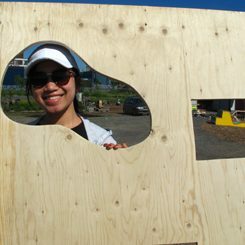 Je m’appelle Olivia et je suis étudiante à la maîtrise en architecture à UBC, Vancouver. Mon intérêt pour l’approche « design build » et mon amour pour Montréal, ma ville natale, motive ma participation au projet Mont Réel. 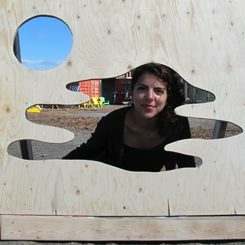 J’espère y apprendre une approche au design et à la construction qui sera démocratique et pluridisciplinaire, en plus d’y rencontrer des gens inspirants. As an artist, I have a long-standing interest in all things related to the built environment and have incorporated architecture-based research and experimental design-build practices in my work for many years. I am particularly interested in modular, nomadic structures that, through their reconfiguration and deployability, resist some of the more confining aspects of traditional architecture and offer a variety of opportunities for itinerant placemaking. 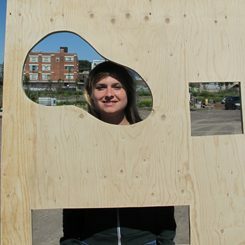 I have also benefitted greatly from opportunities to be a part of interdisciplinary study and exhibition models that combine the imaginative and critical functions of art-making with some of the driving questions and concerns of architecture, design, landscape architecture and ecology. I recognize that I am motivated to continue to work in a collaborative way and to be part of projects that are even more participatory - in spaces that intersect more directly with different kinds of cultural, social and political activities, and where it might be possible to experiment more directly with innovative ways of re‐thinking approaches to built‐space in relationship to social space and environmental context. 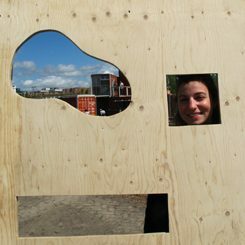 The collaborative working format, the experimental approach and the intention to engage critically with questions of urban transformation as described in the Mont Réel call align very strongly with my own interest in place-making and design-build practices, and their respective relationships to social, cultural, and ecological vitality. Every opportunity that I have had in the past to work in a collaborative fashion has challenged me to see my role as an artist in a new way, enhancing and nourishing it through dialogue and exchange. Negotiating, as it does, the relationship of the parts to the whole both functionally and symbolically, collaborative work and knowledge production allows new, unforeseen patterns to emerge. In this sense, by working with a diverse group of people on a common but open-ended goal, I expect the unexpected to have a chance to be observed, heard, visualized and materialized. Je suis présentement étudiante au baccalauréat en Arts Visuels et Médiatiques à L’Université du Québec à Montréal et j’entamerai ma deuxième année dans ce programme en septembre prochain. Je voulais me joindre au Mont Réel car je désir m’investir davantage dans le milieu de l’art urbain et construire cette structure se voit une formation motivante sur plusieurs niveaux. Je suis grandement motivée par l’engagement collectif que favorise le projet. Travailler en groupe avec des gens provenant de différents domaines sera très enrichissant. 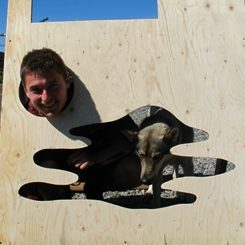 Je crois aussi que l’atelier me permettra d’apprendre sur la manipulation et l’assemblage du bois. I am currently a student in the Design program at Concordia and my main areas of interest at the moment are furniture and lighting design. I am curious about learning more about wood and its capacities, so I can later on apply them in my own practice. 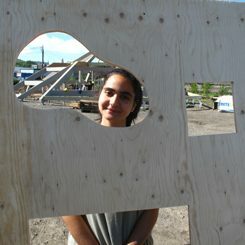 I believe that with this workshop, I am going to be able to learn more about woodworking and urbanism. Overall, I am confident that this workshop will allow me to gain more skills and knowledge. 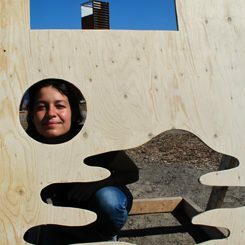 Un étudiant à L'Univeristé de Montréal en architecture, et ancien stagiaire dans l'ONU au Soudan. J'adore participer dans des concours tels les Ideas Forward 24h, et intégrer les recherches que j'ai fait au sein de l'UN Habitat et l'UNICEF dans mes projets scolaires. I'm a huge fan of Construct Lab's projects and their focus on adaptability. Likewise I dream to work as an architect/ designer on projects that grow on strong community participation. Mont Réel a la capacité d'établir une forte dynamique sociale, car la construction même du projet crée de nouvelles connexions enrichissantes dans la communauté étudiante. I expect to learn team-building and hands-on practical skills over the course of the workshop. I will be involved in the before, during and after of an architecture/ design project, and work with international students and mentors! I will apply the skills gained from this learning experience in my future initiatives, especially in organizing team projects. I am an undergraduate student of architecture at University of Toronto. I have proposed designs for the northern wall of the Varsity Centre, and the Robarts's library extension, both at the University of Toronto. The program is a good opportunity to work closely with experts and people interested in design, art, planning and the community itself. Also, I want to see the approach and perspective from a place with a different context, history, and language than Toronto, where I have mostly spent my time as a student. I expect to hear innovative ideas to possible solutions that design can give to improve communities in terms of spatial and environmental justice. Also, I hope to hear about architectural conservation and ecology and its role in the city and community identity. Finally, I expect to have a great time and create long lasting relationships. I graduated from the Architecture School of Marne-la-Vallée in 2013. I went to Geneva to do my final year internship and I work there ever since. Working in an architecture office, economical efficiency too often runs the project. I need to get back to basics : a project for all, made with sensibility and authenticity. I expect to be part of the project by being in the heart of action. Je détiens une formation de deuxième cycle en architecture et en histoire de l'art. 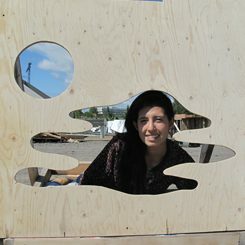 Je travaille dans le domaine de l'aménagement depuis plusieurs années, notamment en recherche au Centre canadien de l'architecture (CCA) et en diffusion à la Maison de l'architecture du Québec (MAQ). 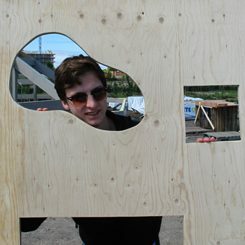 J'ai aussi participé à différents projets de médiation dans l'espace urbain, entre autres, au sein du collectif Points de vue. Souvent investie dans des projets qui se planifient longtemps d’avance derrière un ordinateur, j’ai très envie de me plonger dans cet atelier collaboratif intensif sur le terrain et de voir apparaître le Mont Réel de mes yeux et de mes mains! J'ai la conviction que je rencontrerai des personnes passionnées et passionnantes qui apporteront chacune leurs expériences uniques au projet. 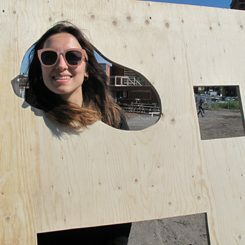 Ce sera l'occasion de partager nos expériences, nos points de vue, nos façons de travailler sur des sujets comme l'architecture, le design urbain, l'art, l'implication de et dans la communauté, etc. I graduated from Mimar Sinan Fine Arts University, İstanbul in 2015. I have internships and work experiences throughout my undergraduate study. I have worked for 1,5 year as a junior architect at B-Design Architects, İstanbul. I am currently a last-year master student in Environmental Control and Construction Technologies Programme at İstanbul Technical University. Now I am studying on active structures; designing kinetics for architectural facades, shell systems. 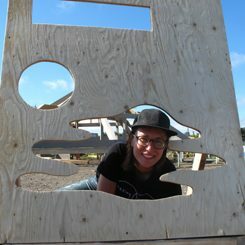 I am constantly eager to learn new things and extremely interested in learning about recycled materials, sustainability techniques and wood constructions. Developing and building a kind of realisation of a mountain and the exploration of surrounding neighbourhoods the University of Montreal’s makes me very excited! 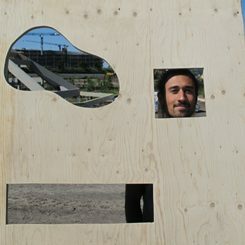 Three weeks in Montreal seems like full of fun, learning wood construction methods, collectively explore, creating collaborative and most of all, meeting new people from all over the globe. This workshop, which I am sure will make me grow both professionally and humanly! 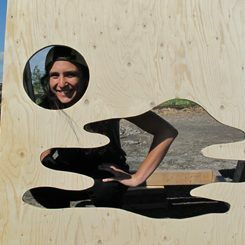 I'm a design industrial student in Paris, passionate about territories and materials experimentations. 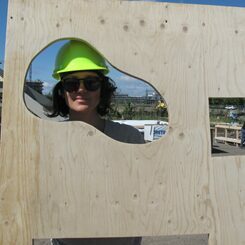 Most of my work explore social possibilities in public spaces. In 2016 I organised with Bellastock the Superstock festival, an construction event in the suburbs of Paris. I'm really interested about experimental architecture and collectiv creations. 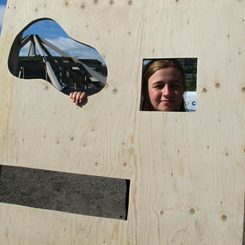 This project is a great opportunity to explore a new area and creat with lots of differents peoples. 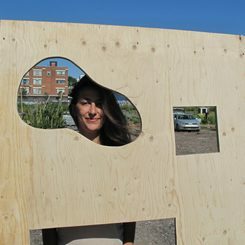 I expect to be part of a creative mouvement, meet many different people, architects, designers, artists and also the Montréal citizens !